Subscribe here if you want to Subscribe to JUST new Design Contests. …right here in the Print & Play Admagic shop! All ideas start somewhere. So, our first order of business here is to thank Ian Reed of Breaking Games for pitching the initial idea of launching a contest at Gen Con 2018. Thanks for getting the ball rolling, Ian! 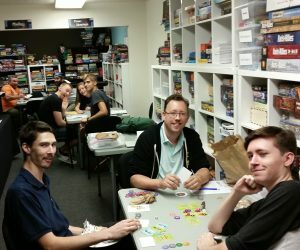 We had a blast planning and prepping for our first Pick & Play Game Design Contest with our sister company, Breaking Games. Once the basics were discussed, we had a name and made a logo. 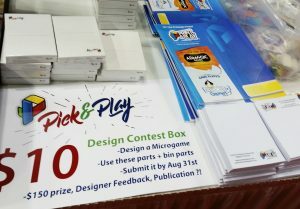 Then, the contest starter packs were made right here in our Print & Play Admagic shop. Here you see one of our skilled shop staff wrapping one of the 50 contest starter packs we brought to Gen Con. Before we go on, let’s quick pause and say a big THANK YOU to all who wanted to participate in the first ever Pick & Play Game Design Contest. And, even bigger THANK YOU to those that sent their design in for judging. Yes, we did wonder how many we contest submissions we would receive! And, to those of you that picked up a contest starter pack at Gen Con, but didn’t have time or space to make the deadline, we are rooting for you! Do not despair. Keep designing games. This is just one of many great contests out there. To Gen Con We Go! 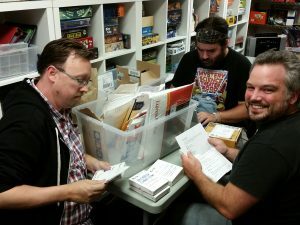 With all the starter packs made and bins of sweet bits to choose from picked and packed, we traveled to Gen Con 2018. Each starter pack came with 18 blank poker (M:tG) sized cards, two d6 dice, a meeple, and basic info including a link to the web page for more. Starter packs were $10 and contestants could spend another $2 to add 16 game bits to the starter pack bits. Contestants chose one item from bin 1, five from bin 2, and ten from bin 3. Michael Epstein of Copper Frog Games was the first to pick up a starter pack. Thanks Michael! The last of the 50 starter packs was claimed back on Sunday morning, the final day of Gen Con. So exciting! As game designers and so many others worked to fullfill their final day plans at Gen Con 2018, 50 potential game submissions were already in the planning stages. 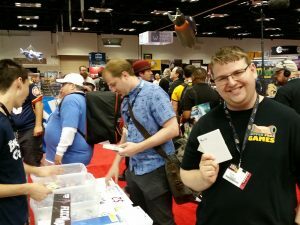 – All 50 contest starter packs were purchased at Gen Con! Thank you all! 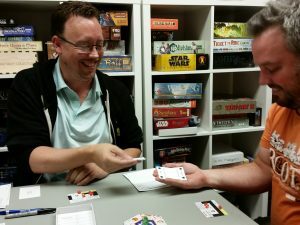 – During the month of August, contestants took their 18 blank cards, two d6 dice, a single meeple, and up to 16 additional “picked” game bits and transformed them into radically different games! 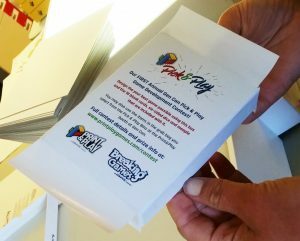 – 19 of the 50 starter packs returned to us as games submitted to the Pick & Play Game Design Contest. – Judges put in roughly 100 hours over 2 days to play test the contest submissions and rate them all. – Judges played through all 19 games experiencing a wonderful abundance of creativity. Thank you, again, to all the designers for sharing your creativity with us. – Judges completed 103 feedback forms. In the end, after the ratings for each game were tabulated and judges entered final discussion, front runners emerged. The top three games are all micro games and each design used the starter pack components well. Yet, from the common starter pack bits radically different games were designed – so cool! – A fantasy themed co-op. – A competitive space race. Have we mentioned how difficult the decision was for the contest judges to actually pick a single winner, yet? This was a CLOSE, TIGHT competition at the top of the heap. A strong majority of the games submitted, are very worthy of continued design attention and further refining. A fantasy themed, co-operative, 1 to 4 player micro game with modular board, and 15 minute play time, Fires of Unrest has players as characters with very asymmetric abilities acting cooperatively to quell the unrest growing at six different locations in the land. During set up the locations deck is shuffled and six location cards are placed face up in a line. To win players must quell the unrest at each location. Too much unrest at any one location, or not being able to place unrest cubes as required is the loss. Fires of Unrest makes good use of the contest starter pack compoments, as well as the additional meeples and cubes picked from the bins at Gen Con. 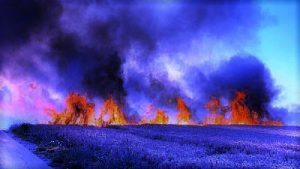 With more development work mainly to fine tune the rule set and character set, the judges agree that Fires of Unrest has a very promising future. An abstract, action point, point-to-point movement, action chaining, pattern making, memory, tile placement 2 player micro game, Rainbow Connections has a modular board that grows a “tile” (card) larger each round. Players score points by manipulating the board on their turn to create the longest chain of the same color they can. One point is scored for each segment in the chain when the active player chooses to stop and score, or after they have used all five of their action points. The cards provided in the contest starter pack are used to make up the game board similar to domino-like tiles with each half of the card printed with a specific color or rainbow colored wild. In addition, each card has an action icon printed on it. To start their turn, Players add a card from their two card hand to any open location on the board. Then a pawn is placed on that card. The action of the card with the pawn on it is the action that the player can use to change the status of any of the (possibly six) adjacent cards, since the board is layed out brick-style. By flipping (yup, the memory element), rotating, relocating and more, players modify the board. Then, the pawn moves to the card that was modified and the action of that card is the action they can employ on any of the neighboring cards. A game making added twist is that each color may only be scored once in the game. For example, if player A scores blue, player B no longer has blue as a scoring option. 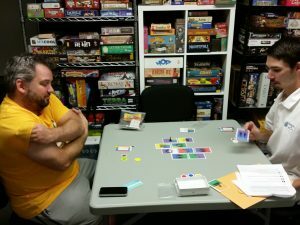 Rainbow Connections is totally for the evolving puzzle game crowd and does it super well. Out of all the games submitted to the Pick & Play Game Design Contest, the judges felt that Rainbow connections was the most complete, ready to publish game. A Sci-Fi, space themed, competative, bluffing, simultaneous reveal, asymmetric, resource management, linear movement, racing, micro game for 2 to 4 player with rock-paper-scissors conflict resolution, Space Race! packs in a lot of mechanisms. Game design is often about reducing and refining and that feels true of Space Race! despite all the mechanisms employed. Each mechanism mentioned has an appropriate place in this 30 to 45 minute game, yeilding a very promising result. First to the finish line wins. Players are running space ships that each have a special ability and different sized cargo holds. At the start of a round a pair of dice are rolled to reveal what type and quantity of fuel will be available to claim that round. Every player has a identical set of cards that represent actions to take. Each player simultaneously reveals one of their cards. If multiple players choose to claim the fuel available, then they duel rock paper scissors style simultaneously revealing lasers, missles, or quantum rays (??). There is always an option to opt out and advance a space on the board under impulse power. The asymmetric holds and special powers of each players ship lend a very nice touch to this racing game that will be even more of a blast to play with some refining development work done. 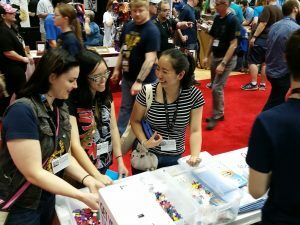 The starter pack components and additional bits picked from bins at Gen Con were well employed by Space Race! A strong majority of judges enjoyed the game play and wanted to do more racing in space. 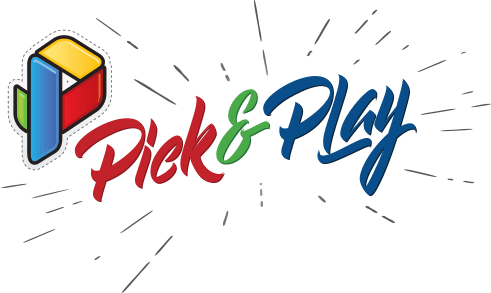 After the ratings were reviewed and compiled – and, after much discussion – the judges made the very difficult decision regarding the ultimate winner of the first Pick & Play Game Design Contest. Michael wins a $100 Print & Play gift certificate, a $60 Breaking Games gift certificate, and a permanent place among Print & Play’s inventory of print-on-demand titles should Michael choose to make Rainbow Connections available through our website. On behalf of Print & Play Admagic and Breaking Games, thanks to all of you that share your creativity and hard work with all who get to play your game designs. Keep designing games and bringing fun to the table. Written on behalf of the Pick & Play Game Design Contest team of judges. Mike is a Media Mole and Warehouse Wyvern for Print & Play Admagic, and manages the Breaking Games presence on BGG and is an occasional Demo Diva. Yes. He does need suggestions for a better job titles regarding his work with Breaking Games! Note: Below is the original contest info. Enjoy! 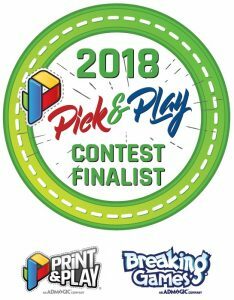 INDIANAPOLIS, IN (August 2 – 5, 2018) – Print & Play, Breaking Games and AdMagic will be at Gen Con 2018, and we will be hosting the First Annual Gen Con Pick & Play Game Development Contest during the event. 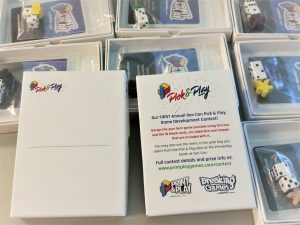 Visit Breaking Games – Exhibitor Booth 2329 anytime during Gen Con 2018 (Aug 2 – 5, 2018) to purchase a Pick & Play box with components to be used to create an original micro-game. Each box will contain assorted stock parts from Print & Play, and there will be extra pieces available at the booth as well. Submissions must include complete rules for playing the game. You may only use intellectual property you own or have rights to use. Theme, mechanics and the rest are up to you! Artwork and graphics do not need to finished. 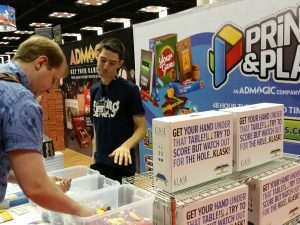 A maximum of 50 Pick & Play boxes will be available for purchase during Gen Con 2018 at Breaking Games – Exhibitor Booth 2329. Limit one box per person/group. 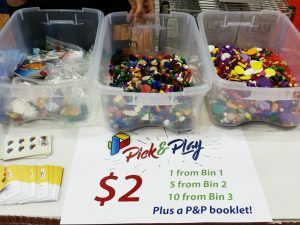 Pick & Play boxes are ONLY available at Breaking Games – Exhibitor Booth 2329 during Gen Con 2018. Each game submission must include your contact information. Game rules must also include the name of the game, number of players, and game length. Game submissions will be played and judged by tabletop game industry professionals. All participants will get a review of their game from the players. 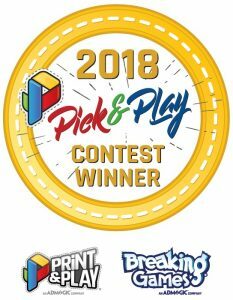 One select entry will win a $100 Print & Play gift certificate, a $60 Breaking Games gift certificate, a permanent place among Print & Play’s inventory of print-on-demand titles, and a chance to be published by Breaking Games! We do not guarantee that the winning game will be published, however it will be reviewed by Breaking Games staff for consideration. Games will not be returned unless you provide a prepaid return shipping label with your game contest submission.